Just Us Girls has a great photo for our Photo Week challenge. These tulips are just so pretty in all that white snow! 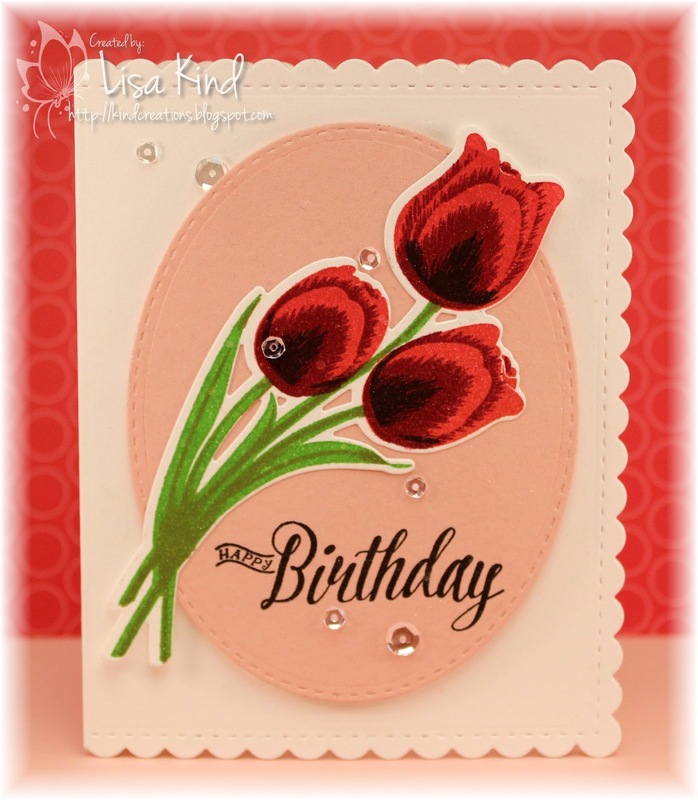 I was just talking about this tulip set with my friend Cheryl on Thursday and looked at this picture later in the day and couldn't believe it was tulips! So naturally I pulled it out for this challenge. I played around with colors for a red tulip with all the dimension and came up with red, scarlett, and black. 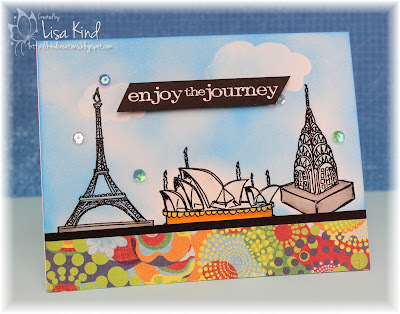 Love the way it stamped out! 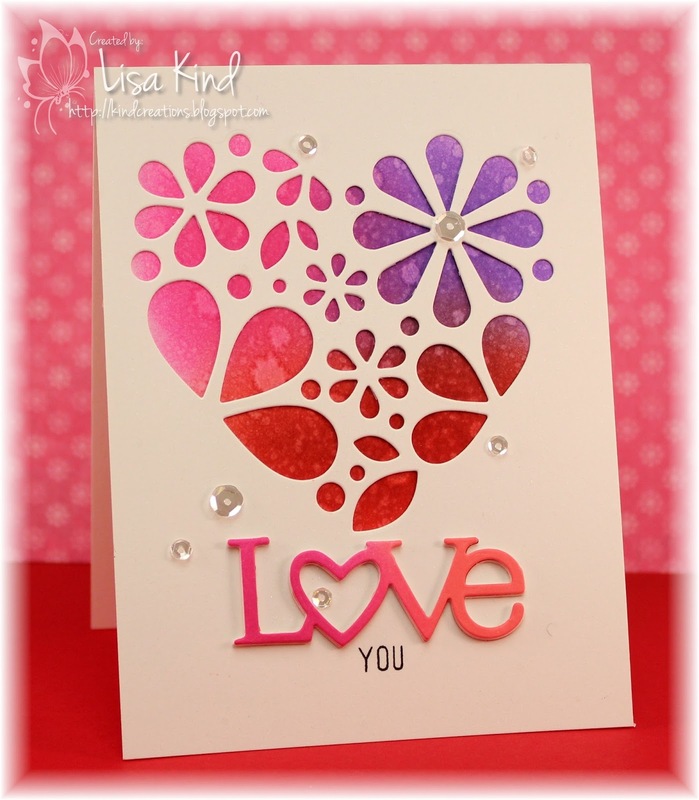 I used the mini MISTI to help with alignment when stamping. I die cut the base and oval using more PTI dies. I spritzed it with shimmer spritz so it's really shimmery and finished it out with a sentiment and sequins. This is going to be my mom's birthday card next month. This is the picture of the room we want you to use as inspiration. 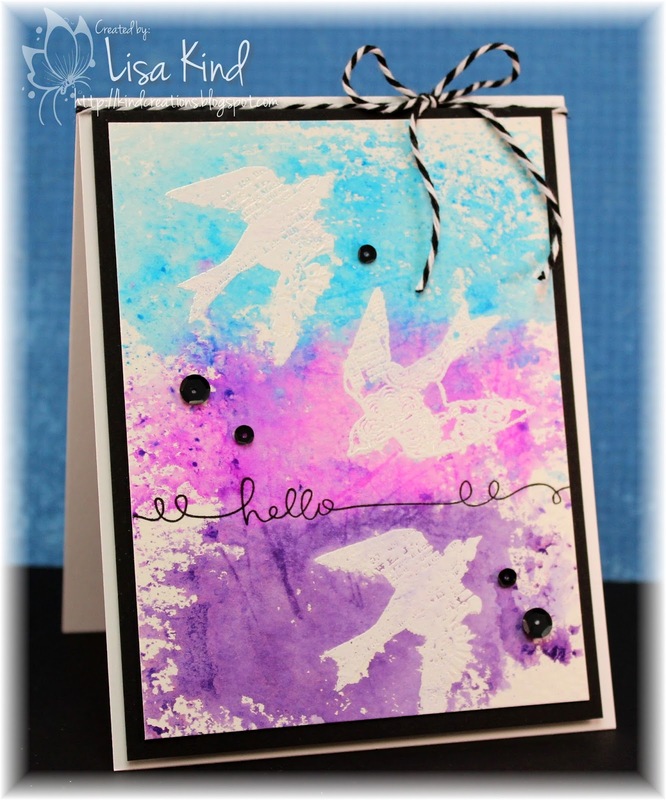 We are sponsored for this challenge by Stamplorations, and I'm using the sweet Trendy Birds stamp set. I saw a card recently using butterflies stamped and colored in this way so I thought I'd try it. I first stamped the birds (there are two different designs, and I used one of them twice) with Versamark ink onto Strathmore watercolor paper and embossed it with white powder. To get the color on the paper, I scribbled ink from Tombow markers on acetate, sprayed it water, and placed it onto the paper. I added more color where I thought it needed it. I'm not sure this is truly my style, but it was something different to do. 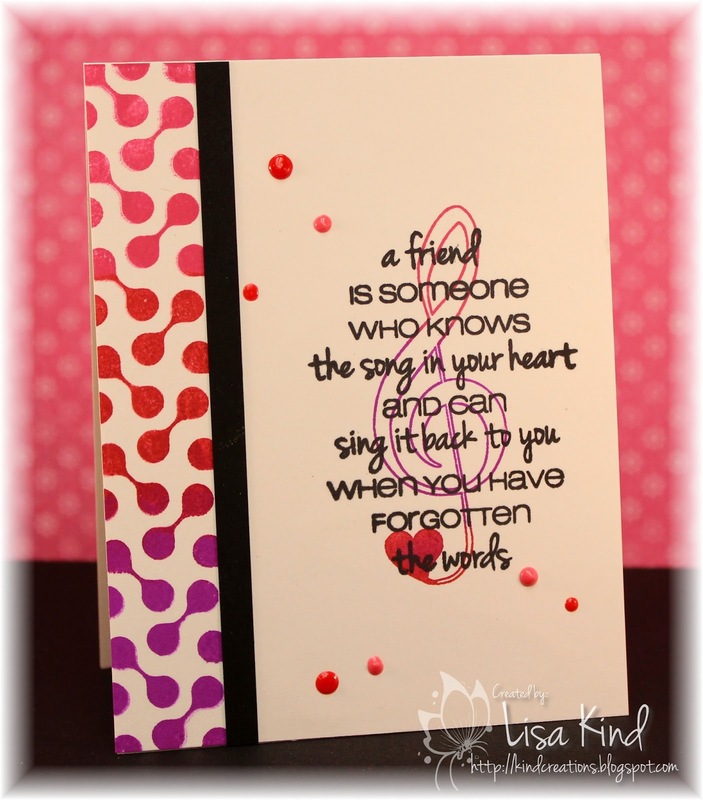 I stamped the sentiment and added black sequins and a twine bow. It's matted on black cardstock and popped up with fun foam. You can see more from the Time Out design team and our guest, KandA, on the Time Out blog. You can also see the great prize Stamplorations is giving away on the Time Out blog too! Hi everyone! I'm waking up this morning knowing I have a whole week free! Mid-winter break and I don't have to go to work until February 27! 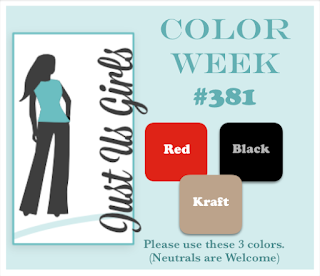 This week is Color Week over at Just Us Girls and Judy chose three colors that I just love together: red, black, and kraft. This Halftone Circle set was sitting unopened on my desk so I opened it! I put the five circle stamps in the MISTI and stamped it with Versafine Onyx Black ink on kraft paper. Then I embossed it with clear powder. I adhered that to the card base with fun foam. I cut strips of black and red cardstock and added that to the left of the kraft. I die cut the sentiment first from black cardstock but thought I needed to bring in more red, so I die cut it a second time from red four times and layered it. To fill in some of the bare spots, I added red and black sequins. Simple graphic card! Hi friends! 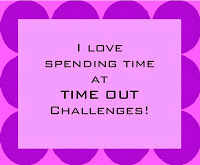 The challenge this time around at Time Out is our Home Sweet Home challenge. 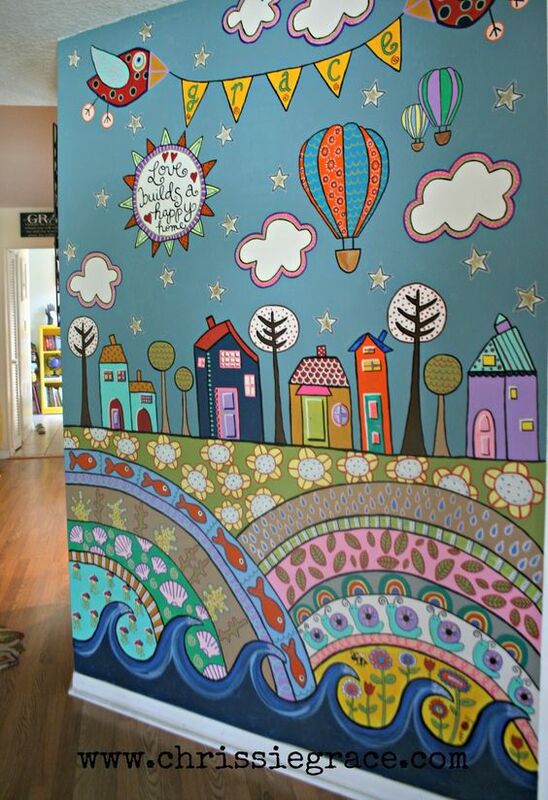 We provide a picture of a room in a house for you to use as inspiration. Here's the photo to use as your inspiration. We are sponsored by Stamplorations for this challenge, and I chose this World Birthday Cake set. I tried to mimic the houses in the photo. I stamped them in Versafine Onyx Black and embossed it with clear embossing powder. Then I sponged blue ink in the background, masking off the clouds. The bottom of the inspiration photo reminded me of this pattern paper, so I added that on the bottom with a skinny strip of black. I embossed the sentiment on black paper with Versamark ink and white powder. I added some sequins and colored the images a bit with copic markers. 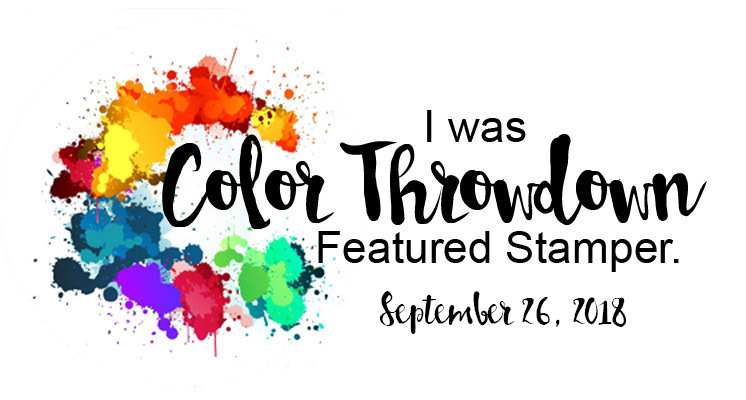 You can see more from the Time Out design team and our guest for this challenge, KandA, on the Time Out blog. You can also see the prize that Stamplorations is giving for this challenge on the Time Out blog as well. Hearts! 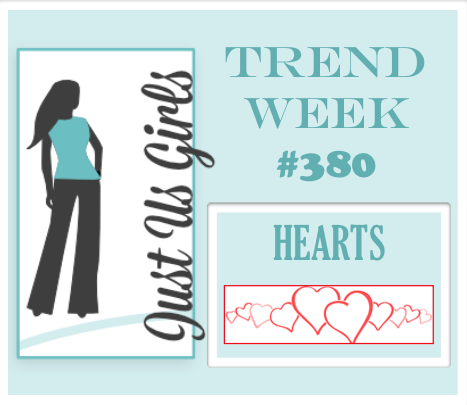 Perfect trend for this time of year! 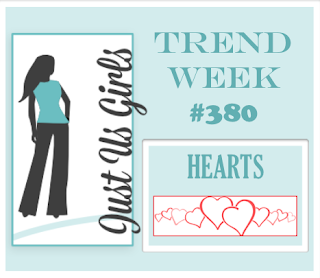 That is what's happening over at Just Us Girls! I picked up this die at Simon Says Stamp recently. I like it because it can be used in many different ways. I first die cut the design from a piece of cardstock then sponged three different distress inks on the card base. I sprinkled it with water to get the droplet markings. The die cut layer was adhered over the inked base. It's also spritzed with shimmer. I die cut the word for times and added that and sequins to the front. Hey friends! I've been pondering these plush dies and whether I wanted to try my hand at them. I realized I had this stitched tag die that I could use for gift cards, so I bought some plush flower dies to decorate it. I'll see if I want to get any of the other plush dies. I recently bought a ton of felt that Papertrey Ink had on sale, so I may have to get some to use it all up! 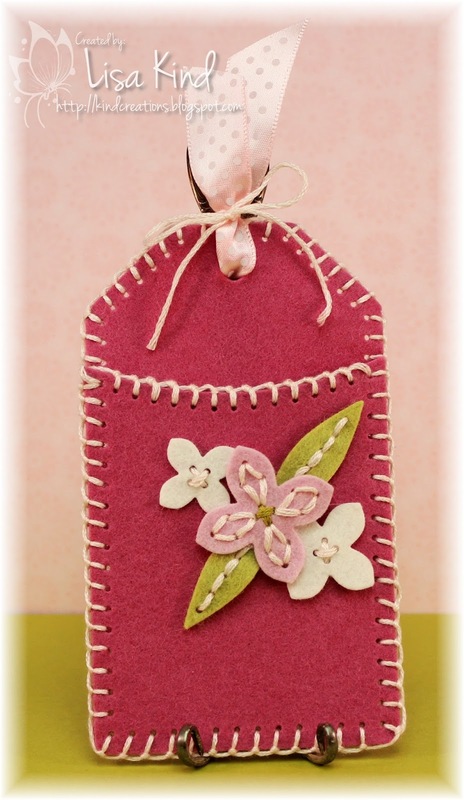 I die cut this tag with rose felt and used the blanket stitch and floss to attach the two pieces together. I then die cut the flowers from lavender and white felt and the leaves from green. I stitched them and attached them with hot glue. 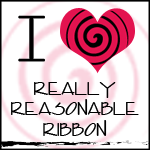 I added the ribbon and tied it up with some floss. I had to urge to add sequins, but held off. Maybe on the next one! Hi everyone! 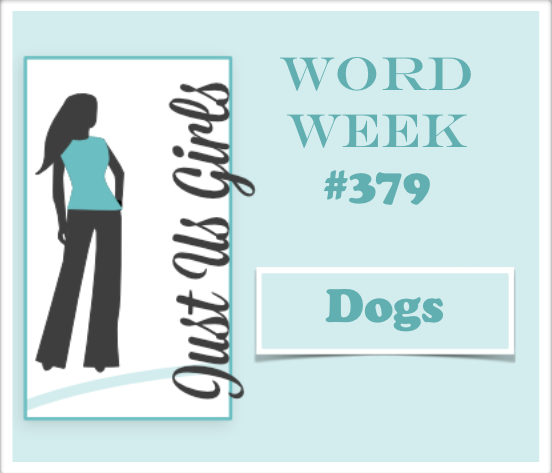 I'm the hostess over at Just Us Girls and it's Word Week. I chose the word DOGS cause I just love dogs! I've had this set from Stampers Anonymous and Tim Holtz since it first came out, but haven't inked it up until now. I chose this cute image cause it just reminds me of my dog. I tried to color it like my dog. She's mostly white with brown spots, but I just couldn't make it work so she's colored all brown. Then I saw the ball stamp and it made it look even more like my Lizzie. She's a fetch-a-holic! 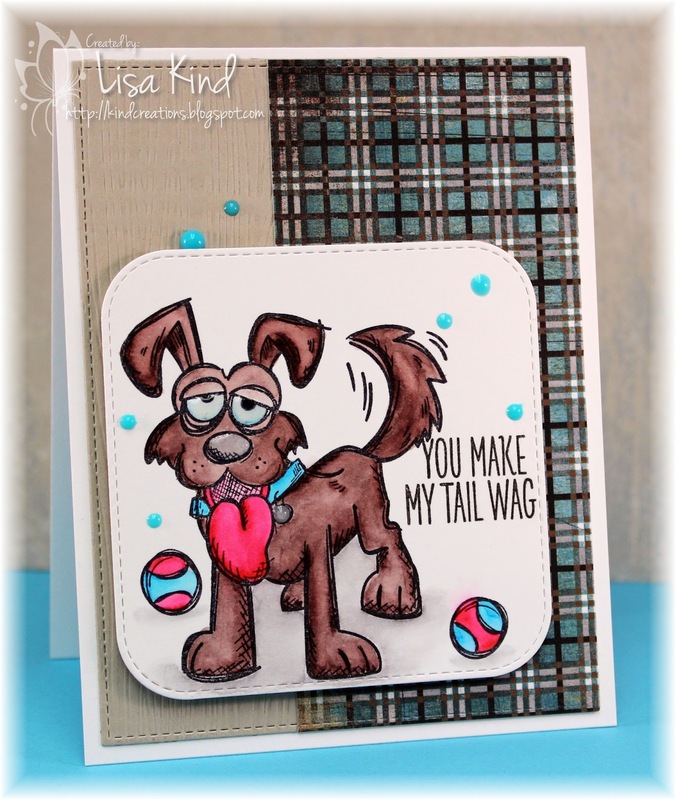 The dog is colored with Zig markers on smooth white Bristol card stock. I added glossy accents to the eyes, nose, and tag on the collar. The aqua dots are Nuvo crystal dots. I haven't used pattern paper in some time, but had to pull out this Max & Whiskers pad cause it's dog themed (although the one I chose had no dogs on it!). 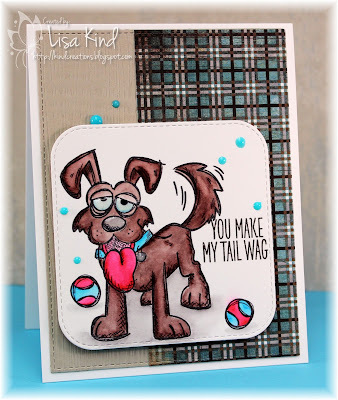 You can see more from the JUGs design team and our February guest designer, Michele Greenwood, on the JUGs blog. Hi friends! Happy Groundhog's Day! 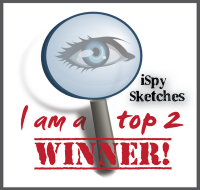 We are sponsored by CAS-ual Fridays for this challenge, so the team is using their stamps. I love the ones I'm using today. I created the background strip by using three ink colors from Catherine Pooler Designs. I used the same three on the music note. The black is from her line also. The inks stamp really nice, but boy are they juicy! Your fingers will give away the colors you used! I finished off the card with a black strip and some Nuvo Crystal Drops. As I said, CAS-ual Fridays is sponsoring this challenge. 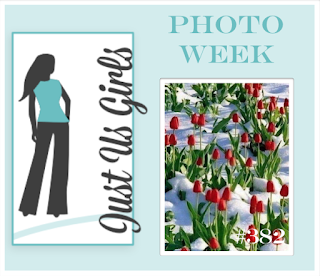 Check out the Time Out blog for details on the prize! 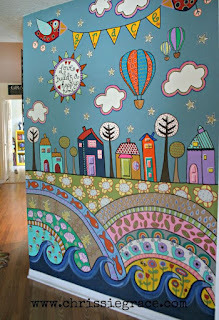 You can see more inspiration from the Time Out design team and our guest for this challenge, Jane, on the Time Out blog.